Mayor Rahm Emanuel and recently appointed aviation commissioner Ginger Evans have been calling for new, faster, premium train service from O’Hare to downtown in a bid to improve the airport’s standing among its domestic and international peers. They argue that the airport is causing the city to lose business. However, while O’Hare is a low-performing facility, the existing Blue Line service isn’t the airport’s limiting factor. The idea of high-speed rail service to O’Hare is nothing new. Under former mayor Richard M. Daley, the CTA spent over $250 million to build a “super station” under Block 37 in the Loop for that purpose. Ultimately, the proposal went nowhere, and the empty station space currently sits unused, a monument to poor urban planning. High-speed train service to airports – with fares that typically run several times the non-express rate – is becoming a emoree common amenity among busy, international airports. However, express service that runs directly to the center of town is uncommon. 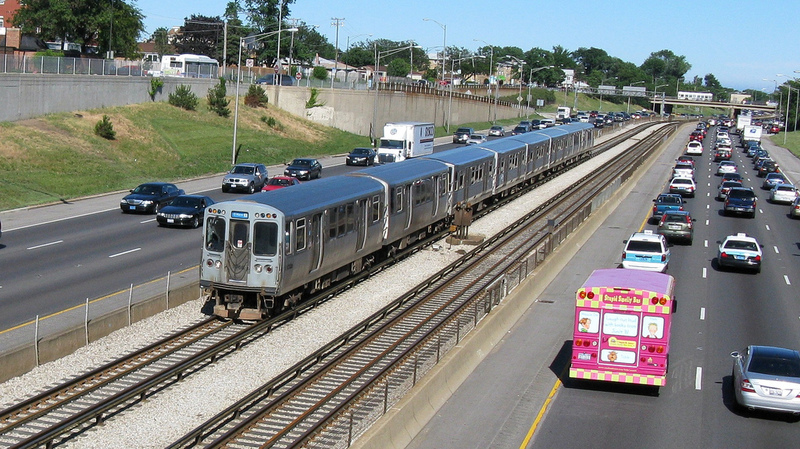 Chicago is unusual in that both O’Hare and Midway offer efficient train service to the Loop. According to the Blue Line’s schedule, it takes 38 minutes to travel from O’Hare to the Clark/Lake station, a respectable pace that’s often faster than driving. Throwing more money at the O’Hare express idea that could otherwise be used for improving or expanding existing transit service is a bad idea. There are much more cost-effective ways that current O’Hare Branch ‘L’ service could be upgraded. Moreover, the CTA should work on improving travel times to the airport from many of Chicago’s densest neighborhoods that aren’t near the Blue Line. The O’Hare express proposal has been endorsed by Tribune transportation writer and aviation buff Jon Hilkevitch, who recently referred to the Blue Line “old and slow”. While age doesn’t necessarily make a train line sluggish, deferred maintenance does. However, the CTA is currently in the midst of the $492 million Your New Blue project, which is rehabbing seven stations and removing slow zones from Grand to the airport. The agency estimates these upgrades will shave five minutes off the trip from downtown to O’Hare. Despite the fact that a trip to the airport will soon take little more than a half hour, Evans recently told the Sun-Times that a premium train line to the airport is “essential infrastructure” because other peer cities have one. However, she also told the Tribune that other cities’ airports are “stealing traffic” from Chicago because O’Hare has many flight operations problems that put the airport at or near the bottom of on-time rankings, so perhaps premium train service shouldn’t be her top priority. As of April 24, 2015 [PDF], only 3.3 percent of the O’Hare Branch tracks were under slow zone restrictions, in which trains are limited to 35 mph. Some of the branch’s tracks are already in good enough shape to allow for speeds greater than the CTA’s systemwide speed limit of 55 mph, and all of its train cars are capable of traveling 70 mph. One reason for the current speed limit is that faster speeds would result in more wear-and-tear on the tracks and wheels, thus higher maintenance costs. The Blue Line is already a great alternative to taking a taxi. FiveThirtyEight analyzed travel times between airports and central business districts in major cities and found that only in Chicago, Minneapolis, and Honolulu was it faster to take transit than a cab. On weekdays, trains run between Clark/Lake and O’Hare every 2 to 8 minutes during rush hours, with ten-minute headways during non-peak times. Airport express trains in other cities typically have 15-to-30-minute headways. Waiting longer to catch a premium train to or from O’Hare might nullify any advantage from the higher speed. The current push to create “world-class” train service to O’Hare is a distraction from actually fixing what’s wrong with Chicago’s transit system. In a recent Sun-Times op-ed, public policy consultant and former mayoral candidate Dr. Amara Enyia argued that spending money to create a premium train line would be a case of skewed priorities. Rather, she argued, the focus should be on improving transit for Chicago residents. “Maintaining our streets continues to be a challenge that affects transit time, quality, and safety,” she said, adding that CTA service cuts have made it more difficult for residents to access jobs. Building the infrastructure for the O’Hare express would be costly and complex. In addition to somehow creating new right-of-way for the trains, new platforms would be required at O’Hare and the downtown station (likely the half-finished Block 37 super station) in order to keep regular Blue Line customers from boarding the express trains. Evans shared with the Sun-Times her far-fetched idea of building double-decker Blue Line tracks to make space for the new trains. She argued that more capacity is needed on the Blue Line in general. However, outside of rush hours, the line already has enough capacity to carry more trains. She pointed to premium train services in London and Germany, which she said help make their airports “premier international gateways.” Notably, the the London Heathrow Express train costs $62 round trip if you don’t buy your ticket in advance and has 15-minute headways. Previous studies suggest the O’Hare express trip would take 25 minutes or less, and cost $20 to $25. In contrast, a non-stop train ride from Amsterdam’s airport to the downtown costs less than $5 and leaves every 5-10 minutes – which sounds very similar to the Blue Line. Create more space for luggage on the trains. This could mean removing seats on some cars running during peak flight times to make room for the kind of luggage racks typically seen on airport shuttle buses. Improve the signage at the O’Hare station. The current “Next Train” and “Do Not Board” signs on the platforms are easy to miss. Have you ever boarded one train with its doors open, only to be told, or come to realize, that it’s not leaving but the other train is? Improve the walk from the O’Hare terminals to the ‘L’ stop. Replace dingy ceiling tiles and modernize the lighting and décor. Experiment with different ways of marketing the Blue Line to travelers. Are visitors to O’Hare’s official website finding information about the CTA, in their language? How can airlines be involved in promoting the service? One thing’s for sure: If the city is going to create express rail service to O’Hare targeted at well-heeled travelers, it shouldn’t do so with any amount of public money. Otherwise, it could become the transit equivalent of the Illiana Tollway, a taxpayer-subsidized boondoggle that would get relatively little use, which may never provide a return on investment. B. Premium airport service can generate premium fares. That’s a unique revenue source for infrastructure improvements. We need to tap that! So if you like trains at all and the Mayor says he wants to upgrade trains, you ought to cheer (even if he doesn’t pitch it exactly the way you might want him to….)! The fares from the loop and McCormick Place won’t even cover the operating cost of a premium express service. This plan will siphon funds away from other needed transportation priorities, and distracts from them. Now, a regional rail system that stops at the airport AND may other places is what we do need. However, at the rate we’re going, we’re going to get our equivalent of Toronto’s UPExpress line, which was originally billed as a money maker, but in reality requires subsidies, move far fewer people that other train lines, and consumes the right-of-way that is needed for regional service: a boondoggle. I was a Jeff Park local until recently, and I for one would have loved a denser, more upscale business/retail district nearby, not to mention Brown Line service. Plenty of international airports have figured this out. Don’t make the perfect the enemy of the good; if more languages are helpful to some travellers, we shouldn’t refrain just because we can’t cater to every traveller. Problem is, you get of the NCS and it takes 20 minutes to get to the terminals. The planned extension of the ATS would cut that to 13-15 minutes, including transfer time from the NCS to the ATS. Overall travel time might be a little longer, figuring in wait time, a 5-stop train, and where in downtown the trip originated or terminated; but the ambiance of Metra may be preferred to the CTA. In addition, the NCS also serves the northern suburbs and one can use a Metra pass on the NCS as well as on their normal commuting line. Capacity-wise, a separate high-speed airport line won’t fit along the Metra Milwaukee District line which, if anything, needs another track from Union Station (Lake Street) to Franklin Park for reverse-peak express trains. Restoring a fourth track is no simple matter with requirements for wider track spacing and relocation of infrastructure. The fourth track will preserve local service to this northwest sector of the City and allow more capacity out of Union Station for both North and West lines. Union Station has limited capacity for storage for second and third peak train cycles that require unload/load and go, Milwaukee District (and NCS) trains also must cross the UP West line simultaneously at Western Avenue; and that’s a topic in itself. Capacity also would be stretched in the peaks for extending existing, let alone expanded, Amtrak services to O’Hare. Even minor inbound Amtrak delays are too unreliable for running through Union Station on close schedules. High speed rail would be built to a standard that couldn’t use the MD-W right of way anyways. There’s too many sharp curves. HSR would also use a new tunneled station as the approaches to Union involve sharp curves and slow switches. For an HSR line, money would be spent on new tracks. For a regional express train, yes, the current layout of the MD-W line is problematic. Running both stopping and express services requires significant investment. What language? Are there one or two other languages that would really be useful enough to spend millions of dollars on signs? The language of international travel is English. Shaving 5-10 minutes off a Loop-to-O’Hare trip would increase ridership on the Loop-to-O’Hare segment. But if it comes at the cost of either frequency or operating budget for the other lines, then it may well decrease overall ridership. Are you suggesting effective transportation never requires subsidies? The interstate highway system got more than 53 billion dollars in four years (more than, say, Amtrak has gotten in ten times that timeframe). And yet it’s still considered a world-class highway system. Trains should be held to the same standard. No. I’m saying that subsidies should be used to support effective transportation. There’s an argument floating about that an express train to O’Hare or [name your airport here] is worth doing despite low predicted ridership because it will make money from having premium fares. We shouldn’t be wasting subsidies on this service when it would compete with a service we already have and subsidize. The CrossRail program, which is described at crossrailchicago.org, involves a high-speed line serving destinations such as Hyde Park, McCormick Place, Elgin, Rockford, and Champaign. Most of these destinations cannot be easily accessed via the Blue Line. However, even to destinations like the Loop – where the Blue Line still acts as an option – the service wouldn’t necessarily “compete”: it would simply provide an alternative option, and would help relieve overcrowding along the Blue Line. My daughter is getting ready to leave out of O’Hare for China. The blue line seems ideal for getting us there. (We’re coming into Chicago on Amtrak). Why not just fix what you’ve got? A dedicated express line from Union Station to O’Hare would serve riders coming into Chicago on Amtrak. This line would run on existing tracks and could be started up fairly quick. The O’Hare Transfer station on Metra North Central line will soon connect directly to the existing People Mover which serves all major terminals. I knew that London is outrageously expensive, but $68 RT for airport transportation? WOW! What’s the Best Way to Provide “Great Airport Transit” to O’Hare? The Hong Kong Airport Express train is a bad example on which to base a Chicago service because it's the Hong Kong airport's only rail link, and it was funded by private real estate operations.